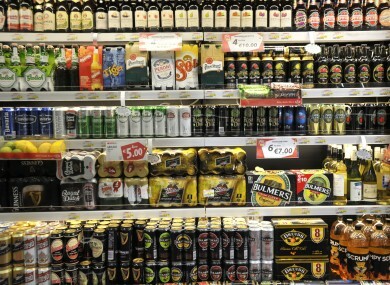 ALCOHOL PRICING, AVAILABILITY and sponsorship are set to be the primary targets of a new cross-party Oireachtas group on alcohol misuse that was launched today. The initiative will be overseen by Alcohol Action Ireland and comprises membership from Fine Gael, Labour, Fianna Fail, Sinn Féin and Independents. The primary focus of the group will be in influencing the forthcoming Public Health Alcohol Bill which seeks to place greater regulation on the sale and marketing of alcohol. Chairman of the group, Labour TD Jed Nash, said that alcohol-related harm costs the state €3.7 billion a year, with the health system alone spending €1 billion on alcohol-related care. “Our agenda is about seeking out quality and balanced information about alcohol harm and using that in our roles on formal committees, in our own political parties and as individual politicians to influence better outcomes,” said Nash. Physical separation of alcohol in supermarkets and grocery shops, banning alcohol sponsorship in arts and sports, further restrictions on alcohol advertising, a minimum pricing policy, and a change in legislation around packaging of alcohol are, in my opinion, all necessary measures. British Labour Party adviser Alastair Campbell was also present to mark the launch of the parliamentary group and ahead of the meeting said that the Irish Government must not be swayed in its efforts by “vested, corporate interests”. In the UK, public policy around alcohol misuse is being heavily influenced by the sophisticated and well-resourced alcohol lobby rather than being directed in the interest of public health. This is evident from David Cameron’s U-turn on minimum pricing last year following pressure from both his Cabinet and the alcohol lobby. Today’s launch of the cross-party group also heard contributions from paramedic Richard Shannon and nurse Anne Burke about the pressure alcohol abuse puts on the health service. The CEO of Alcohol Action Ireland Suzanne Costello says that they will help the group in “whatever way they can” adding that the Public Health Alcohol Bill is “an unprecedented opportunity to begin to address our harmful relationship with alcohol”. Email “Cross-party TDs at least agree on one thing, the need to tackle alcohol abuse ”. Feedback on “Cross-party TDs at least agree on one thing, the need to tackle alcohol abuse ”.